I’m making a coffee table for my daughters apartment. I’m sizing it based on one she has now that she bought for $20 from the BORG made of particle board and laminate that’s falling apart but she says the size is perfect for the space. I’m making this out of Jatoba. My first time with this stuff and maybe my last. This stuff looks great but my tools are taking a beating, plus it’s heavy. You need some serious power for this stuff. So I’m not quite at the part of making the top but have been thinking about my design and how I am going to accomplish this based on what I’m running into so far with this wood. The top will be 36×22 and will have a 75 degree bevel on the bottom side of all 4 edges and I’m wondering the best way to cut this. My first, and only, thought was to run it on edge on the table saw with it set at 15 degrees and run all four edges but I am now rethinking this because it will be heavy and awkward and my saw will struggle and most likely leave some nasty burning. So what are some other options to make this cut? I saw something on the Woodsmith shop where they made some sort of jig for a router to make an odd bevel. I know I could make a tall fence for the table saw for support it’s really the end result of that cut I’m concerned about. Any ideas on approach to this? Thanks in advance. I know you don’t want to hear this, but I have a large 15’ bevel router bit that I picked up at a going out of business sale at a Woodcraft a while back. I use it to simulate raised tops on my electric guitars. Worked great, save that having that big bit spinning in my largest router while I was holding it tended to make it gyoscopic. I think the bit makes a 2” wide bevel, but the doggone bit is expensive if I had to buy it today. Safest way I know. Instead of just a tall fence, make the fence part of a sled so that you could clamp the top to it. That would hold the top very secure, helping make a good cut. Make the cut a little wide (1/32) then make another cut to take off the 1/32 just to clean it up. Got any hand planes? You could .ark the bevel, hand saw reliefs, a d then plane down. The drawing shown by jayb looks like it shows a good idea. I may not understand the direction of the bevel, but why the need to stand it up on an edge? From reading the question post, my thought was to use the table saw but I would be laying the piece down flat. I’d also think I could make this type of cut with a corded, powerful circular saw after clamping a guide bar to the table top. But I repeat, maybe I have the wrong image of the cut edge. I d also think I could make this type of cut with a corded, powerful circular saw after clamping a guide bar to the table top. But I repeat, maybe I have the wrong image of the cut edge. You need to stand it on edge because of the angle. Most table saws can’t be angled to 75 degrees so you put it at 15 and stand it on edge. 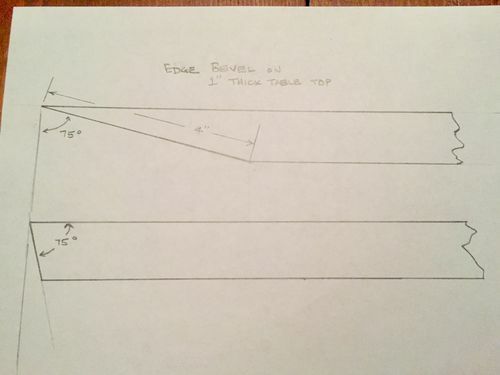 I’m probably going to go with the sled type of jig but make one to straddle the fence for a little more support since running the 22” edge will put 36” in the air and then just take tiny passes. I gotcha, Scott. Like I stated, maybe I was thinking of the angle incorrectly. Re-reading your opening post, I am sure I got it wrong. Check these options done in my personal version of sketch up. I first thought you intended to make the lower design. Thus, the upper bevel in the image portrays the way you want to make this table edge. A 10-inch table saw blade won’t cut much more than circa 4” depth, implying that the top can’t be more than about one inch thick, maybe a bit less. I agree making a vertical, well-supported sled is a good method to try. Another idea would be to cut a 45-deg bevel with the piece laying flat on the table saw to remove a good chunk of material. Then, hog off the remaining wood needed to hit the desire bevel using a hand-held power planer. I’d do this with a straight guide line drawn along the inner edge of the bevel, on the underside of the top. I would try to start with a top piece that was a little bigger than the desired finished top, so I could straighten the edges on the table saw once the underneath bevel is in place. Good luck, let us know what works out! 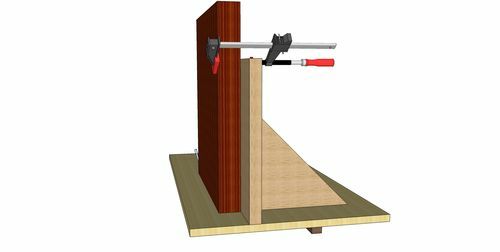 Whether you make a sled or just jig up a fence with feather boards, I would use a rip blade on your table saw to make the cut go a little easier. I tend to just leave my combo blade on but for a cut like this a rip blade is the worth the trouble. Outfeed support will also make this safer as you won’t be having to worry as much about keeping downward pressure on the board as its center of gravity moves beyond the edge. Whether you make a sled or just jig up a fence with feather boards, I would use a rip blade on your table saw to make the cut go a little easier. I tend to just leave my combo blade on but for a cut like this a rip blade is the worth the trouble. Outfeed support will also make this safer as you won t be having to worry as much about keeping downward pressure on the board as its center of gravity moves beyond the edge. Both of those are in the plan. Thanks.